I realized yesterday, while talking with my mom about a childhood ski trip to Jackson Hole (where I basically learned how to downhill ski), that it's been a while since I've skied. Growing up in upstate New York, we would cross country ski every year. We would also take trips, such as the one to Jackson Hole, and one where we went skiing in Yellowstone. In Southern California, skiing is very accessible with Big Bear only an hour or so away, but still I have yet to take advantage of the slopes. Perhaps that is something to add to my to do list? This year for winter, many ski themed items were put out by retailers, all of which I thought were cute, but probably not for me since I'm not exactly a Snow Bunny anymore. Well, a few of those items were reduced insanely low, so, as you may imagine, I couldn't say no. I am featuring two here today because the weather has taken a turn for the "cold" here and I was inspired by this cold front to finally get out some of my more winter themed items. The first sweater, the J. Crew skier sweater, is the first of my ski themed items. I thought it was fate when I found it after Christmas in my size and it was the only one. I picked it up for $35. You can't beat that for an all wool sweater! The second ski themed item is this skier graphic tee shirt from J. Crew Factory. This, I suppose, is a more abstract take on the ski theme. I thought it might look cool with some houndstooth for a little more nontraditional take on the preppy ski look. Sweater and tshirt twins on both items! Thanks for the styling inspiration for both of them, Katie! 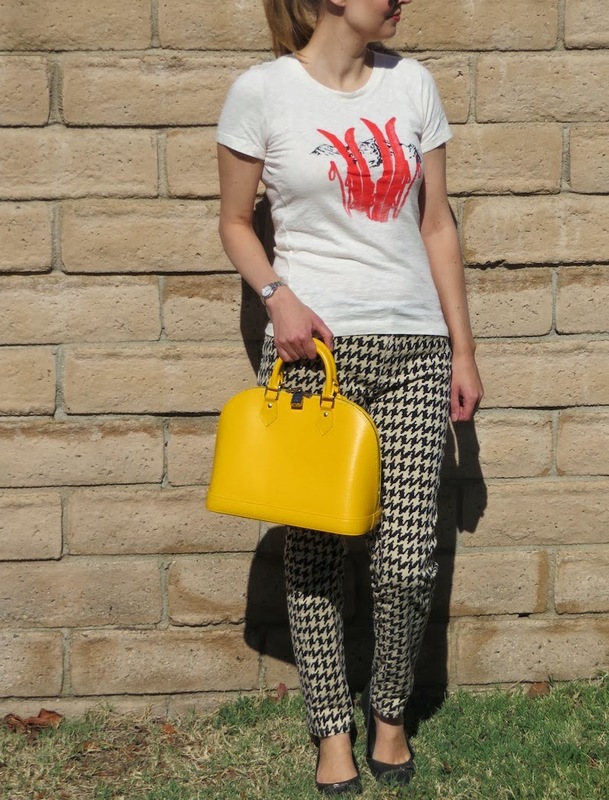 Love the houndstooth pants! How's the fit Katie? Never tried any of their bottoms, only tops. Curious to know. I think the pants fit pretty tts. These are from Joe Fresh line sold in JC Penny's so I am not sure if they are the same as the Joe Fresh store brand.